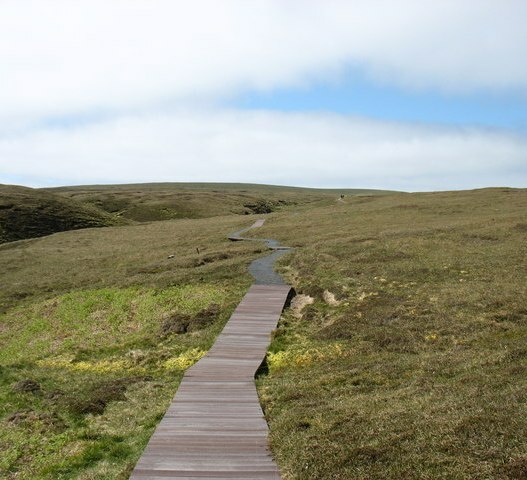 To protect the blanket bog of the Hermaness moorland, a boardwalk has been constructed for most of the way from the visitor centre up Winnaswarta Dale to the cliff top on the other side of the Herma Ness peninsula. From the car park, you walk north-west across moorland to reach the Toolie cliffs on the west side of Hermaness, and then north along the magnificent sea cliffs to the top end of Herma Ness, which will be the closest that you are likely to get to the northern-most point in Britain. From the top off the cliffs you look down on a small group of rocky islets or skerries about half a mile offshore. The islet furthest north is Muckle Flugga. The name comes from Old Norse, Mikla Flugey, meaning ‘large steep-sided island’. There is a lighthouse at the northern end of Muckle Flugga. It was maintained by keepers until 1995 when the lighthouse was automated and the keepers moved out. The lighthouse shore station near Burrafirth is one of the few in Scotland which is separated from its lighthouse. Muckle Flugga and the lighthouse with Out Stack in the distance. In the foreground is the ‘Taing of Loosswick’ on the Herma Ness headland. © Mike Pennington. 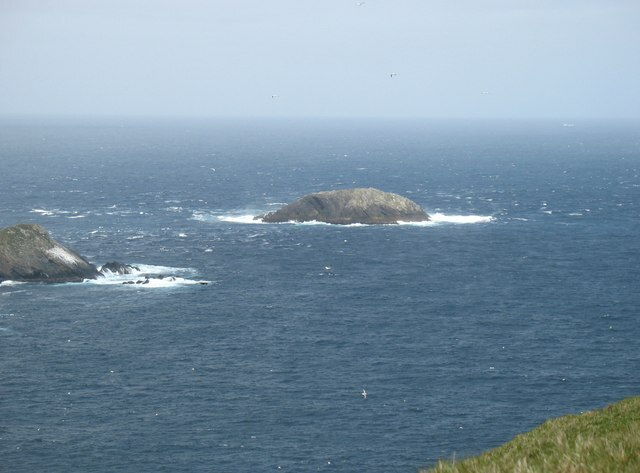 But even further north, 700 yards north-east from Muckle Flugga, is a roughly circular craggy outcrop in the sea suitably called Out Stack, which is the northern-most point in Britain. And that is it. There’s no land between Out Stack and the North Pole. It’s 982 miles by road (and by sea) from Land’s End in Cornwall to Muckle Flugga though that’s not quite right as the road map is actually measuring the distance to the very end of the tarmaced road on Unst, and this is a place called Skaw which is east of Herma Ness. Out Stack or Ootsta, which is also known locally as Da Shuggi, is Britain’s most northerly point. It’s no more than 200 yards by 150, and is only 90 feet high. Unsurprisingly Out Stack has never been inhabited, but it is said that Lady Jane Franklin, the wife of the Arctic explorer Sir John Franklin, landed on Out Stack after reports reached Stromness, Orkney, where she lived, of the loss of the Franklin expedition. The purpose of the 1854 expedition was to traverse the last unnavigated section of the Northwest Passage between Canada and the Artic ice pack. Lady Franklin wanted to get as close as possible to her missing husband. This must be doubted as there’s no safe landing on Out Stack. 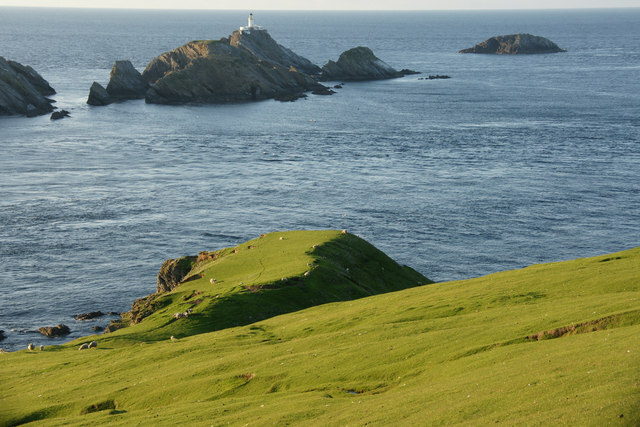 This is one reason, among others, why the brothers Thomas and David Stevenson, designers and builders of over thirty lighthouses all around the coast of Scotland decided in the early 1850s to build the lighthouse on Muckle Flugga and not on Out Stack. Thomas Stevenson was the father of Robert Louis Stevenson, the author of Treasure Island. Robert Louis Stevenson visited Unst to see the lighthouse and the map of the island in his book bears a marked resemblance to the shape of Unst. 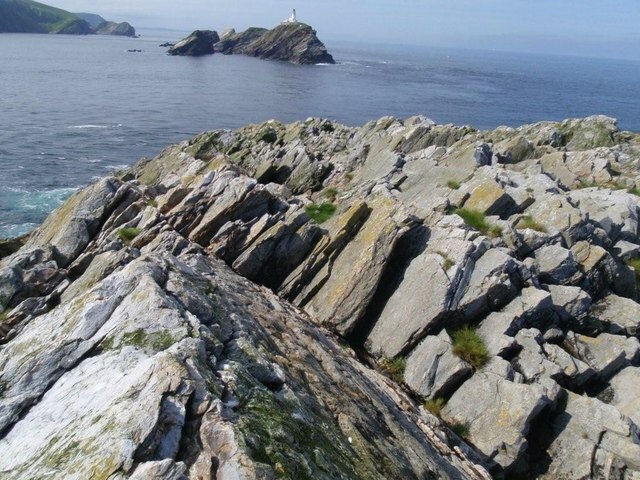 Acording to a local tourist website, boat trips to Muckle Flugga and Out Stack can be arranged in the summer starting from the shore station for the Muckle Flugga Lighthouse which is at the end of the B9086 and close by the entrance to the Hermaness NNR. 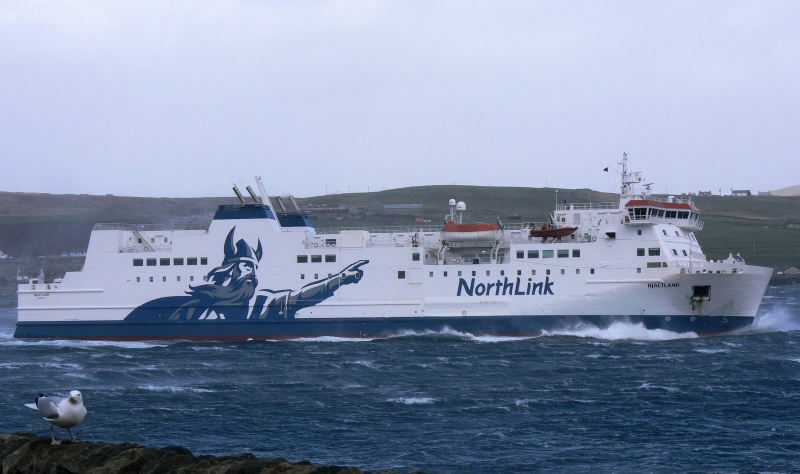 Alternatively there are whole days tours in summer from Lerwick in a catamaran operated by Thule Charters, though a strong stomach is advised as the sea can be rough. If all else fails you can book a passage on the MS Norröna of the Smyril Line, a Faroese shipping company, which operates weekly sailings between Denmark, the Faroe Islands and Iceland. The Norröna takes a northerly route past Shetland, and as it passes Unst, Out Stack can be seen from the ferry. The map shows Hermaness NNR in the north-west of Unst, and the path (in green) to the cliffs at Toolie and then north to the headland of Herma Ness from where Muckle Flugga and Out Stack can be seen. During the summer, thousands of seabirds including gannets, guillemots, fulmars, kittiwakes, puffins (photo right © James Warwick), and shag return to nest on the cliff faces. Inland, great skuas (known locally as boxies) nest in the blanket bog together with dunlin, golden plover, and snipe. Red-throated divers nest in the bog pools.